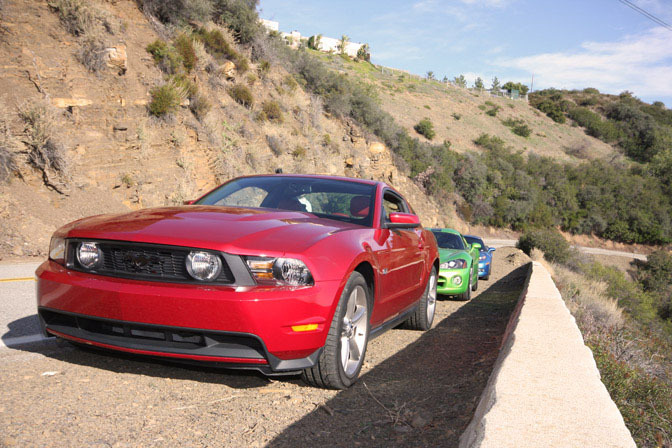 Luxury4Play held a great cruise from Beverly Hills to Malibu over the past weekend and we crashed it in our loaner 2010 Mustang GT Track Pack. Everyone converged at Beverly Hills Auto Spa way too early in the morning for my taste but it didn’t stop 75+ exotics from showing up. 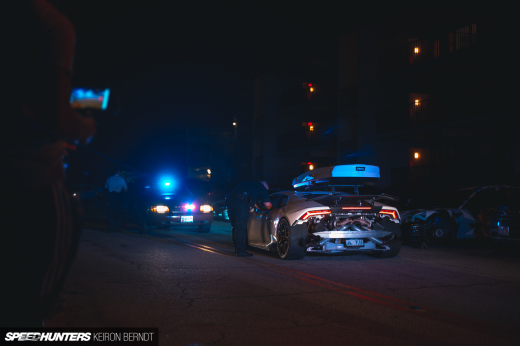 The photography in my guest blog post comes from my co-pilot Ricky Cervantes. You could hardly walk around before the cars started rolling out of the Auto Spa in the morning. 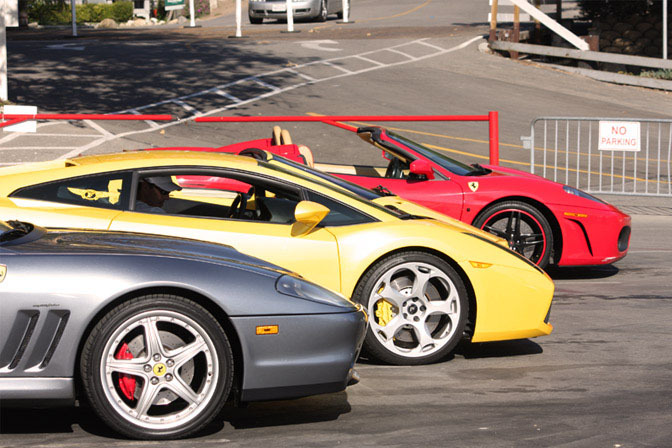 The overwhelming number of Lamborghini’s was obvious no matter where you looked on this Sunday cruise. If you look closely the white car in the center of the image is a Lamborghini LP550-2 Valentino Balboni edition. The 550 stands for its horsepower output and the 2 stands for its RWD setup in the new Lamborghini that sits just over $215,000 MSRP. I didn’t see the car once we hit the road but I spent plenty of time checking it out in the gas station and loved it. Here is another group of cars getting ready to head out on the cruise including a Lotus Caterham 7. This blue Lamborghini Murcielago has one of the biggest exhausts I have ever seen and once we hit the road it proved to be one of the loudest I have ever heard as well. The Mercedes guys all seemed to congregate together with a strong presence of their own. Hidden just behind the SLR McLaren was a super clean black Maybach 57. To keep us from jamming up the roads we were given three routes to pick from while heading out towards Malibu. Our group decided to take the Pacific Coastal Highway (PCH 1) to Paradise Cove in Malibu. 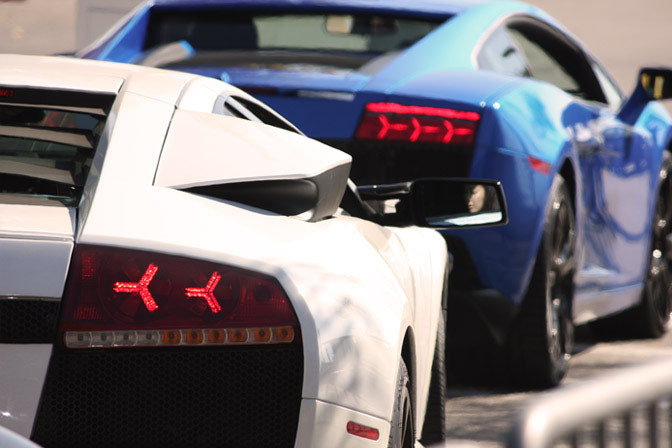 Here are two Lamborghini’s leaving Beverly Hills and hitting the open roads of Los Angeles in the early morning. 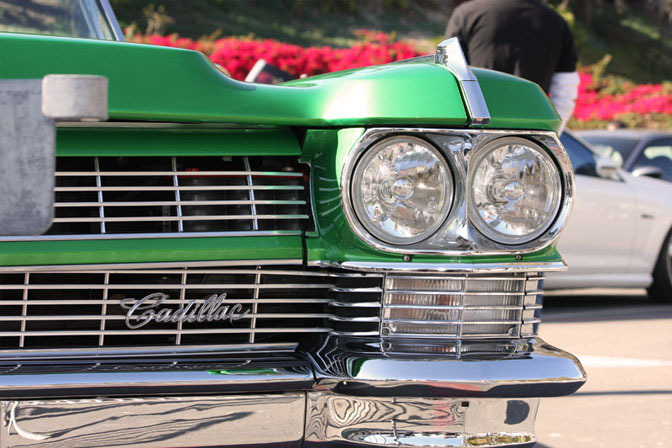 I wasn’t the only American car in attendance and while I am not sure who was driving this old school green Cadillac I couldn’t stop looking at it all day. A few cars had great interiors on the cruise and this Bentley GT stole the show in my book with an over the top interior. 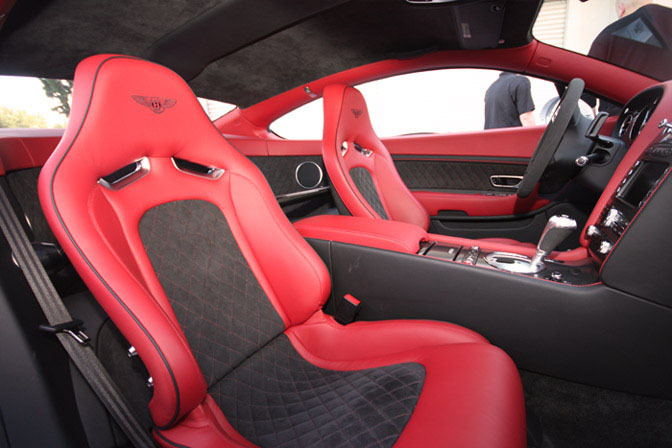 The Premier 4509 kitted Aston Martin was a close second when it came to a great looking interior but the red accents stole my heart in the Bentley. Santa Monica Blvd. was quickly overrun by the sound of high revving exotic cars. A Lotus Elise lead the group of cars from this intersection being followed by a Lamborghini Gallardo, Aston Martin, Ferrari F-430, and a Lamborghini Diablo VT. The PCH route I mentioned we took was a popular one with the group and we passed tons of guys on the cruise on the small section of Highway 10 we had to take to get onto Highway 1. At Paradise Cove in Malibu we all enjoyed some lunch on the beach with fellow Luxury4Play members. After eating, many of the members hung around to take photographs and hang out. 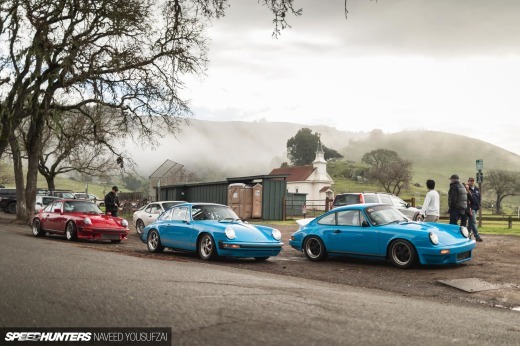 I got together with a few cars and split from the large group so we could have some real fun in the canyons. 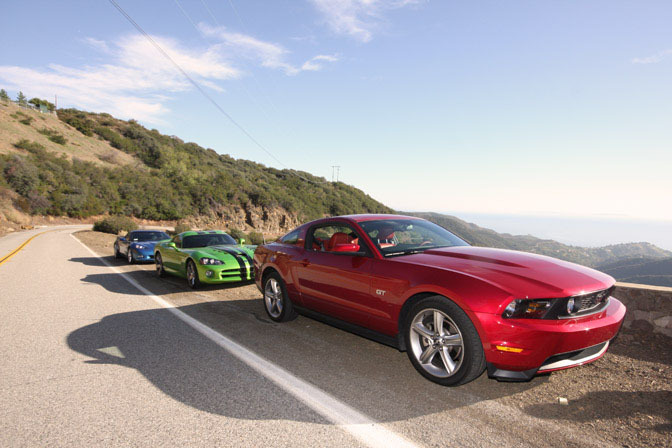 It wound up being the Ultimate American Muscle Car Trip as we hit some Malibu Canyon roads with a Corvette Z06, Dodge Viper SRT-10, and us leading in our 2010 Mustang GT Track Pack. After a few hours of driving and photo taking with the Big Three Muscle Cars, we called for an end to our Sunday just minutes before the sun set on the Pacific Ocean. A huge thanks to everyone at L4P for being so hospitable with a super special thanks to Aimee Shackelford for inviting us out. NOW THAT"S A DOPE CRUISE!!! Are those stock exhaust pipes on the Lamborghini Murcielago? Cant be. I didn't realize that Crown Vic taxis were considered exotic! LOL! That second to last pic is the order i'd buy a corvette a viper and 2010 mustang.Because i'd have all three and i wish i was in your place in that stang. The Murci's exhaust is crooked, how embarrassing. 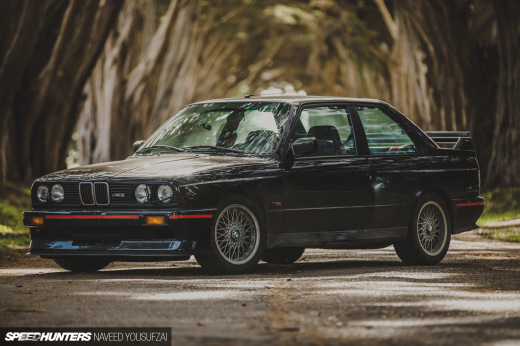 Some please make Joey Redmond a permanent member of Speedhunters!!! All of your articles are just too awesome to be considered a "Guest Blog" post lol. The L4P cruise, these guys know how to represent. desktop of the shot with the white and blue lambos PLEASEEEEE!!! All of those pictures and nothing on the aston martin...FAIL!! That white Bentley GT is the latest Super Sport, that is why the interior is so cool, it comes stock that way!